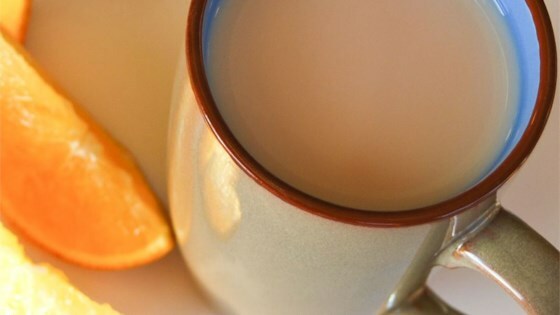 "A delicious, warm, old-fashioned style Chai Tea. With yummy spices, and authentic flavors, it's bound to be a hit with the whole family!" Combine the milk and water in a saucepan over medium-high heat. Once this mixture has warmed, place the orange peel, cloves, cinnamon stick, peppercorns, nutmeg, sugar and tea leaves into the pan. Bring to a boil, then reduce heat to medium-low, and simmer until the color deepens to your liking. Strain out spices, and pour into cups. Delicious! I just added 1/4-1/2 teaspoon of ginger and a couple of cardamom pods to make it even better. Good recipe a bit too sweet for me. I opted out of the orange peel and next time I'll put less sugar. Also, I threw in a few cardomom pods and they sealed the taste. A great recipe! Instead of sugar I used a little honey for extra flavor and less sweetness. I have never had "real" chai, but I thought this was delicious, and it is a keeper. Nice change of pace from regular coffee or tea.